The Villa Book is a ready guide to a collection of villas and city centre apartments available for holiday rentals, personally selected by The Villa Book team. Based on over 26 years experience in the villa business, and long, close working relationships with property owners and local agents, they are able to cater for most individual requirements, whether it is a recommendation for a romantic getaway for two, a larger villa to suit an extended family or group of friends, a tranquil seaside retreat or at the heart of a great world city. The French Villa Book contains over 200 properties in the regions of Provence, the Côte d’Azur, , St Tropez, Biarritz, the Ile de France, the Ile de Ré, Corsica and Normandy. There is also a Paris Apartment Book, featuring over 30 apartments in the historic centre of Paris, mostly on the Ile St Louis and in the Marais. With a concierge service available on request, these are ideal for both holiday and business trips. Most of the properties have at least some maid service and other services can usually be arranged, including a full time chef, yacht charter, babysitter or transfers to and from the airport. Unlike a hotel holiday, staying at a villa offers flexibility, privacy and space to unwind and The Villa Book will ensure a personal service to make sure you find exactly what you are looking for. 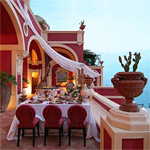 The magnificent Palazzo Santa Croce in Positano is offering special prices for reduced occupancy. Stay at this stunning villa for one week and pay for just 6 nights. For any bookings at Villa Felceto in Southern Tuscany, guests will receive a welcome case of Chianti wine upon arrival. Half board for the same price as the normal bed and breakfast rate.... AND 7 nights for the price of 5. 7 nights for the price of 6 at all Elounda Gulf villas for bookings in Spring, early summer and Autumn. For any bookings between 1st March and 31st October, we are offering 2 extra nights, free of charge, plus a complimentary rental car. Book a week at this elegant villa on the shores of Lake Como, and enjoy a special cooking lesson with your private chef! Book a week at this beautiful, brand new villa and enjoy a complimentary boat tour of Lake Como. Book a week at this delightful villa and enjoy a walking tour of Bellagio and surrounding area, or a special Food and Wine Package. Book a week at this beautiful villa and enjoy a walking tour of Bellagio and surrounding area, or a special Food and Wine Package. We are offering a 20% discount at this charming manor house, and a day excursion to Paris. Large discount for stays at this beautiful property before the end of April. This offer applies to bookings from 25th April - 9th June, and 22nd September - 3rd November. We are offering a substantial discount at this beautiful villa near Manacor. The Villa Book offers a wonderful selection of villas to rent in Provence, the Côte d’Azur, St Tropez, Biarritz, the Ile de France, the Ile de Ré, Corsica and Normandy. Most of the properties have swimming pools and maid service, and other services can be arranged on request. All the properties are inspected by Villa Book staff, and included in our portfolio for their locations and the high standard of accommodation they offer. There is also a tantalizing selection of apartments to rent, right in the historic centre of Paris, mainly on the Ile St Louis and in the Marais.